West Ham United football club is up for sale and 4 parties are supposedly interested in buying the club - a deal that is expected to be around £100m overall. The back page of the Evening Standard newspaper tonight goes into more detail and focuses on the intentions of one of the interested parties - Malaysian businessman and multi-millionaire owner of Air Asia, Tony Fernandes. 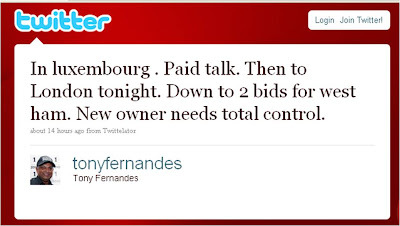 However, on closer inspection the Evening Standard reporting about Tony Fernandes seems to be based on one thing, a tweet that Mr. Fernandes posted this morning! "Fernandes was rumoured to be looking for a 50 percent stake in the club...... but in a Twitter post today, Fernandes said: 'In Luxembourg. Paid Talk. Then to London tonight. Down to 2 bidders for West Ham. New owner needs total control.' Fernandes comments suggests he now wants 100 per cent ownership....."
I don't know what I'm more surprised by, financial journalism based solely on Twitter comments or a global businessman tweeting about a £100m deal that he plans to complete shortly?